Why the fu*k is that in my fly box? : Nymph Edition – By Dana Harrison. Today we explore some of the most common used nymphs on the planet, why they catch fish and what they were designed to represent. Sometimes it’s not always obvious from the name of a fly what it was designed to imitate. Such as the Hare’s Ear Nymph, the only piece of info we really get from that name is that it is indeed a nymph of some type. But as someone who is new to fly fishing and entomology (bug nerd) you might have no idea what type of nymph it’s supposed to be. Whereas with the San Juan Worm, it is quite clearly supposed to be some type of worm. So let’s break down some flies, discuss what they are supposed to be and hopefully, you will hook up with a few more fish. I don’t think there is a fly on the planet that has caught more fish than this fly. Without a doubt, I can say it’s been my highest producing fly in my fly fishing career thus far. I never leave home without one and when I don’t know where to start, it is often my first choice to tie on. I tie it in several variations and in sizes from 10 to 16. This fly is an absolute monster when it comes to catching trout, but why does it work so well? For starters, it can roughly mimic a few actual bugs in the water such as mayfly nymphs, scuds or sow bugs. In larger sizes, it can even pull off a stonefly nymph. As with a number of popular nymph patterns the shape plays are a large role in its effectiveness. The taper from head to tail is a solid representation of numerous bugs in the water. Sometimes I find the more fish I catch on one fly and the more beat up it gets it actually starts to work better. When the rabbit fur gets torn up a bit the fly takes on an entirely new level of bugginess. I will literally fish a Hare’s Ear until it’s basically a hook and a bead. Though it’s far more likely I will donate the fly to a tree before this happens. I highly suggest you never leave home without one of these flies in your box. 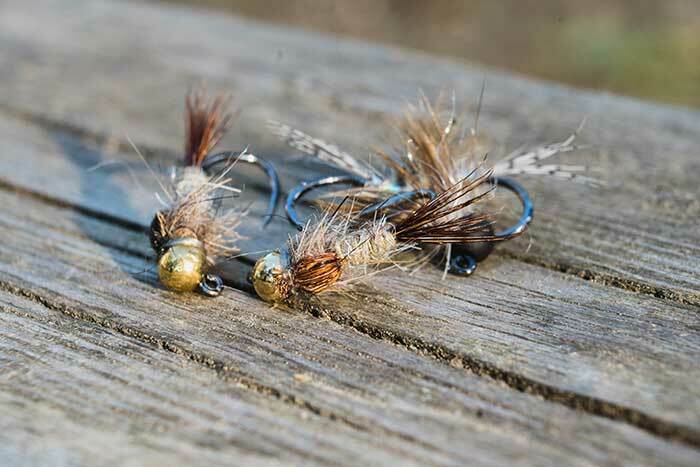 Again we have another fly named after the materials used to tie it and not what it is meant to represent in the water. While I am not against this naming method, I do very much prefer the more colorful names some flies get. 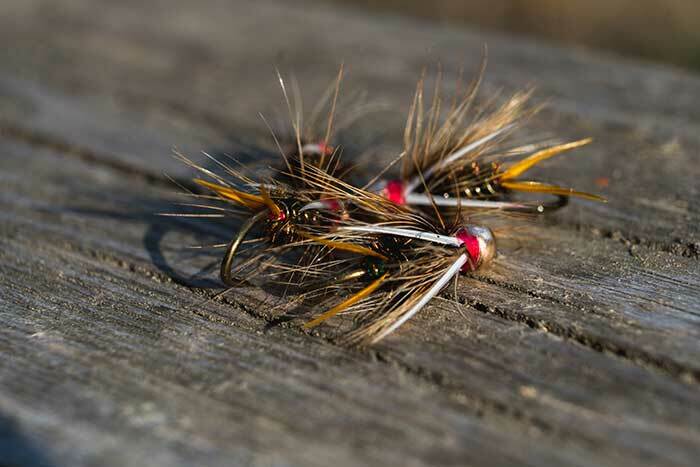 The Pheasant Tail or PT as I call them is another staple of the game and should always have a place in your fly box. The PT was originally tied by an English fellow named Frank Sawyer and thus in some places, the fly is called a Sawyer Pheasant Tail. I suggest you Google the name Frank Sawyer and do a little reading as he is an interesting subject in his own right. 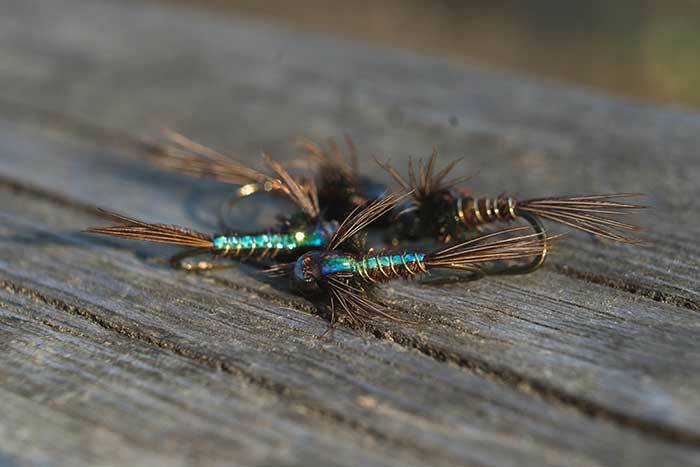 Frank originally designed and tied the PT in order to imitate a baetis nymph or what people very often call olives. Again the design of the fly overall lends itself to the water insect profile being wider near the head and tapering towards the tail. The fly was originally tied without any type of bead, but I always like to sneak one in there in order to help it get down that much faster. Due to the types of bugs, this fly is trying to be I only tie it in two sizes, 16 and 18. I normally only fish the 16’s, but when we get late into the year the 18’s simply out perform. There are now many variations of the PT out there and with all the dyed colors of pheasant tail available these days the options are endless. I highly suggest you tie them all! At least this one finally has a fun name, but it still does nothing to tell us what type of bug it’s supposed to be or why we choose to throw it in the water. Well, the funny thing about the Prince Nymph is that it wasn’t designed to actually be a particular bug in the water. In fact, most people consider it to be simply an attractor style pattern. Others argue that it falls into the stonefly nymph category. The one thing we can all agree on is that it catches fish. The Prince Nymph actually has an interesting story behind it. The fly was originally tied by Doug Prince, but he did not call it The Prince Nymph. He simply referred to it as the Brown Forked Tail due to the brown goose biot tails. It wasn’t until Doug had provided this fly to be published by one of his friends where it got its current name. See Doug never told his friend the name of the fly and when the magazine had to go to print, he called it The Prince Nymph and the name was forever cemented in a publication. The modern version of the fly has almost everything you could ever ask going for it. A gold bead, biot tails, peacock body, hackle collar and biot wings! So many classic trout fly materials all in one fly. I don’t stray much from the modern version of this fly except for the collar. I tie mine with more of a soft hackle collar as I often fish them more on the swing than anything else. Hopefully, this helps demystify some of the flies you had sitting in your box and possibly shed some light on the history of these classic flies. Remember, you always catch more fish on flies you tied yourself and keep those barbs pinched! Dana Harrison is a local Kootenay kid, living the Kootenay Life. 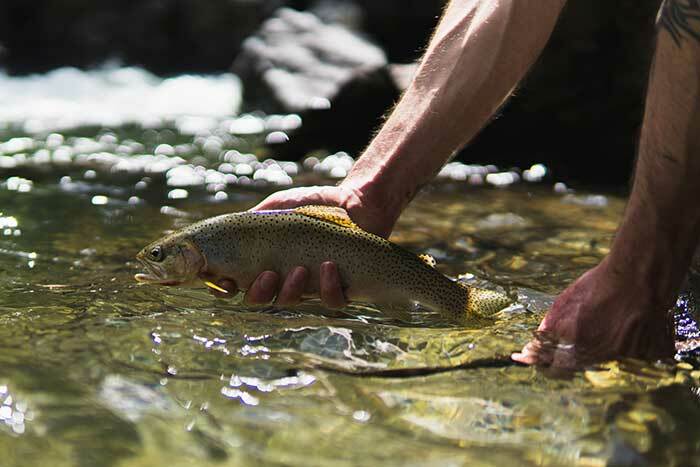 Avid fly fisherman, fly tier and Hook And Vice Ambassador. His favorite Hook And Vice cap is the LoPro Trucker – Hook.